The Chernigov-Gethsemane Icon of the Mother of God is a copy of the famed Ilyin-Chernigov Icon of the Mother of God (April 16), which was to be found at the Trinity-Ilyin monastery near Chernigov on Mount Boldina, and where in the eleventh century St Anthony of the Kiev Caves struggled in asceticism. St Demetrius of Rostov described the miracles of this icon in his book THE BEDEWED FLEECE. He wrote in conclusion: “The end of the booklet, but not of the miracles of the Most Holy Theotokos, for who can count them?” The grace-bearing power of this icon is manifest also in its copies. On the advice of the head of the Lavra, Archimandrite Anthony (+ May 1, 1877), the icon was placed in the newly-consecrated cave church named for St Michael, Leader of the Heavenly Hosts, which was consecrated on October 27, 1851 by St Philaret, Metropolitan of Moscow (November 19), who assumed an active role in the building of the Gethsemane skete. In this manner, the icon took in the currents of grace of all the history of the Russian Church, it acquired the blessing of St Anthony of the Caves, of St Sergius of Radonezh and of his parents Sts Cyril and Maria (September 28), and finally, of the ascetics of the nineteenth century. 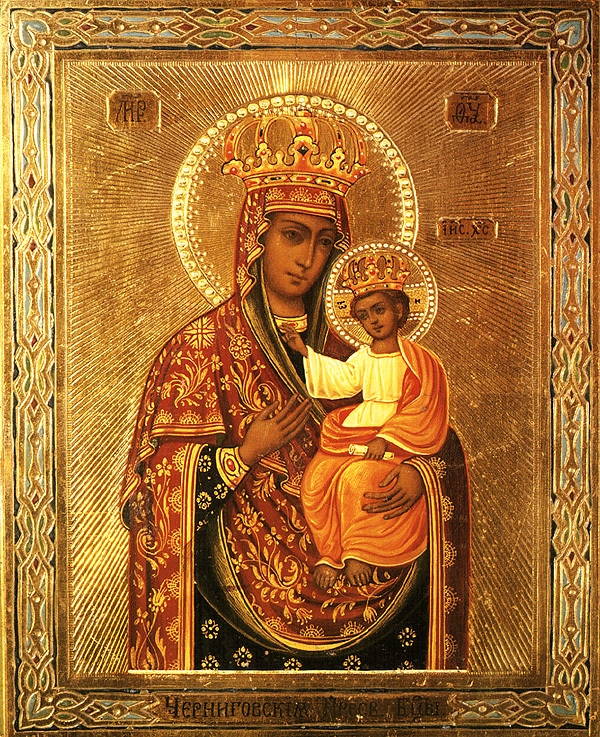 These spiritual connections providentially come forth through the Chernigov-Gethsemane Icon of the Mother of God. Living at the hostel by the caves, and then at the Lavra during the celebration of the Repose of St Sergius (September 25), Thekla recovered completely. St Innocent the Metropolitan of Moscow (October 6 and March 31), learned of the miracle from his daughter the nun Polyxeni, treasurer of the Borisov wilderness monastery. On the feast of St Sergius, he himself met with Thekla and asked her about the details of the healing. On September 26, 1869 St Innocent arrived at the Gethsemane skete and gave the blessing for a Molieben to be served before the glorified icon, while he himself prayed with tears. The initial celebration of the icon was established on April 16, on the day when Ilyin-Cherigov icon was celebrated. Later, it was transferred to September 1, the day of its glorification. At the present time there are copies of the Chernigov-Gethsemane icon at Trinity-Sergiev Lavra. They are found in the temple of St Sergius, in the monastery trapeza, and in the portico of the Trinity cathedral, painted by Elders of the Gethsemane skete and the Zosimov wilderness monastery.